According to the folks from Automotive News, a suit filed in U.S. District Court for the Southern District of New York seeks more than $50 million dollars in damages because Carfax is a "monopolist in the sale of vehicle history reports." For those who are unsure of what Carfax does beyond what you see on their cute little television commercials, they are a company who provides full vehicle history reports based on the vehicle identification number (VIN). Literally every time a vehicle is repaired for just about any reason – or any time it has changed ownership - it will show up on a Carfax report. With the Carfax report, you can see how many times a vehicle has been sold, what damage has been done to the vehicle in the past, if it has been in any accidents, etc. As you can imagine, this kind of report may prevent a dealership from selling a used vehicle that has been wrecked and repaired or one that has been owned by an undesirable owner (like a rental car company). This knowledge of a problematic past can also prevent the dealership from getting top dollar for a given used vehicle compared to the same vehicle elsewhere that does not have a questionable past. In short, it forces a dealership to be honest with the consumers about every vehicle sold – protecting consumers from salespeople looking to pull the wool over the eyes of a prospective customer who is considering a vehicle that has dealt with something like flood damage or a major accident. Carfax forces auto dealerships to be honest in their business practices and as you can probably imagine…they aren't too happy about that. Honesty in the car sales world goes over about as well as a toddler with a pet king cobra. For those who don’t understand why Carfax really matters, let’s say that you are looking to buy a 2005 Saab 9-5 at your local Saab dealership (I’ve picked Saab because they are out of business – not because they are known to have questionable business practices). Your 2005 Saab 9-5 might look fantastic inside and out. It might run and drive great. It might even smell like it is new inside. However, in 2007, your Saab was involved in a flooding situation in which the car was completely under water. After the flooding subsided, the car was sold at auction as inoperable only to be bought up for next to nothing by a guy who owns a body shop. Using junk yard parts, he replaced all of the features damaged by the flooding while also redoing the inside and outside of the car. He did a great job and the car was reliable for him until he traded it in on a newer 9-5 a couple months ago. However, there are still components that were not replaced because they were working just fine but some of those components could be more prone to premature failure. Because of the Carfax history report, you would know all of that information about your 2005 9-5 and you might not care as you are getting a great deal but if you don’t want a flood victim vehicle, you might go elsewhere to buy a used 9-5…or you will use that information to drive down the price of this particular Saab sedan. Without that report, the dealership is free to tell you that the car has never been driven in harsh weather and the condition of the car to the naked eye would confirm that. Carfax empowers the consumer while preventing dealerships from selling problematic vehicles all by providing a vehicle history report. This might sound like a ridiculous example but it is a common practice for shops to buy up inoperable vehicles so fix up and sell…and Carfax makes sure that you know that. When I bought my current Dodge Ram 1500, it was just over a year old and we were offered a great deal on the truck. The dealership presented the Carfax which mentioned that the truck had one previous owner and had been in a minor collision. Based on this information, I was able to have a mechanic look over the area that would have been affected by this crash to make sure that the repairs had been done correctly. They had been, and I bought my truck. However, without a vehicle history report, I would not have known about the damage to the truck so I would not have been able to have it inspected before buying – thus increasing my chances of running into problems down the road due to shoddy repairs. For some buyers, the information about the wreck would have been enough for them to look away from that vehicle so it could have cost the dealership the sale. Luckily, the dealership where I bought my truck was quick to hand me a Carfax report early in the shopping process so I was well informed right away. Having spent a few years working in the accounting side of the automotive dealership world, I got a good first hand look at why dealerships around the country have such a negative reputation for customer service – especially in the case of used car salespeople. Whether in new or used sales, service or even the parts department, dealerships are always trying to sell the customer more than they really need or want. “Anything to make a sale” and in the past, more than a few used car dealerships around the country have sold vehicles that they knew had either current problems hard to spot with the naked eye or they had a troublesome past that could cause the vehicles to be more prone to problems in the future. The problem was that there wasn’t any good way to protect the automotive consumer from being sold a junky car cleaned up to look like new but with the introduction of VIN-based vehicle history reports, car dealerships are forced to be completely honest about the products that they are selling. This access to past information not only forces the dealerships to be honest but it also adds a newer variable to the car-buying process as buyers look at the vehicle history report to compare one vehicle to the next. Consumer America should not be fooled by this $50 million dollar lawsuit. This isn’t about antitrust laws or Carfax supporting anti-competitive practices – this suit is about dealerships wanting to be able to sell used vehicles for top dollar without letting the prospective buyers know what problems that the vehicles have had in the past. Hopefully, the American judicial system will see what is really going on here and they will rule in favor of the company looking to empower the consumer – not the hundreds of companies looking to screw the consumer each and every day. Looking at it from a different perspective, if a private person repairs his own vehicle which was flooded (per the example), then trades it in, there would be no record through CARFAX of it ever happening. That vehicle would also have been issued a salvage title upon auction resale which cannot be overlooked by the dealership or the resulting purchase from that dealership. That title is issued by the state and the salvage declaration can't be removed even upon complete repair. That vehicle will always be branded as salvaged. Reporting to CARFAX is not mandatory, nor is it 100% reliable. While I agree it is a useful tool, it should not be required to purchase a vehicle. Consumers nowadays rely too much on outside people and businesses to make their decisions and choices for them, including companies that have an interest in selling you a service where they never see the product, the buyer, or the seller. Especially with buying anything used, it is buyer beware. I find Mr Rall's statements a bit harsh in his broad painting of all dealerships and their honesty. Mr Rall makes it sound like there is no honesty at the dealership level, sort of like my saying that all reporters/journalists fluff the facts to sell their wares. Sensationalism always garners more attention, and hearing about the normal is dull and boring. The posting by Anonymous put forth some very insightful facts. 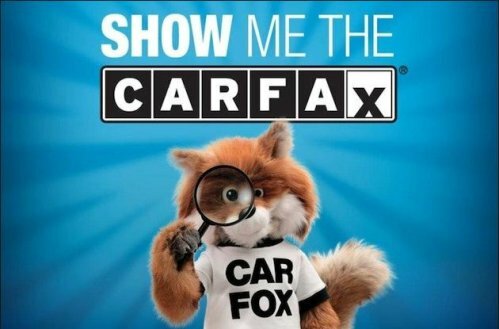 The general public must be made aware of the fact that Carfax is limited in their reporting and is not the definitive word on the condition of a vehicle. It should be used as guidance when purchasing a vehicle, whether the purchase is from a private individual or large corporation. It is always a good idea to have an inspection performed on a vehicle you are considering to purchase by an organization independent from the entity that is selling the vehicle. If the selling dealer or person does not allow you to have the inspection performed, walk away. That should be your red flag. I stand by my assessment that a great many car dealerships deserve their negative reputation. Finding an honest car dealership is like finding an honest politician. We know that both exist but theyre hard to find and the dirty majority ruin it for the rest.